The coastal cruise offers amazing views of many islands and stories that even coastal natives may not know about. This is the third blog post as part of our Dibblers’ Diaries blog, which offers first-person stories from our interns. Summer Rich is a coastal policy and restoration intern. I’ve recently come to a stark realization: although I have lived in Carteret County my entire life, it wasn’t until this internship that I’ve truly gotten to know our coast. Growing up on the coast, the beaches, marshes and ocean have always held a special place in my heart.Unfortunately, it seems I may have taken our beautiful coast for granted. Sure, I could list off tons of secret and less-populated areas on the beach to escape to. I could also tell you where to find great local seafood, or places to adventure not listed in the travel guides. However, after attending a cruise behind Bear Island and hearing presenters and staff members speak about what the North Carolina coast has meant to them throughout their life, it’s clear I still have much to learn. 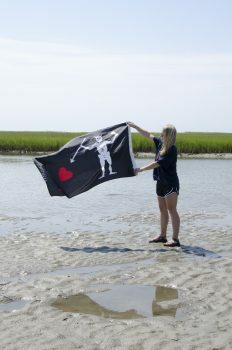 The interns were able to learn about Blackbeard, among other people that shape the history of the area. We recently had the opportunity to attend one of the North Carolina Coastal Federation’s coastal cruises. 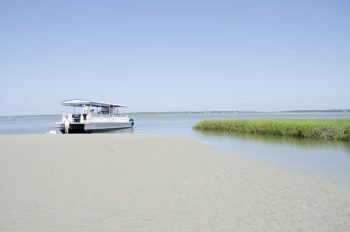 The cruise was an awesome way to explore the salt marsh islands behind Bear Island. We began at the Hammocks Beach State Park visitor center and ventured through “Cow Channel.” We had a chance to view Bear, Huggins, Dudley and Jones islands. Sam Bland, coastal specialist for the federation, gave participants a brief history lesson on many of the islands we passed by. We heard stories about the famous pirate Blackbeard and learned about the history of the islands, including the fort at Huggins Island. Hearing stories about our coast’s history reminded me of spending holidays with family, reminiscing about events in the past that almost seem otherworldly now. I had taken a ferry to Bear Island on numerous occasions in the past, without realize cultural significance of the islands we passed by. Throughout the cruise, Bland pointed out wildlife we encountered along the way, including a kingfisher, oystercatchers, tricolored herons, snowy egrets, great egrets and a least tern. We also heard the call of a painted bunting. However, the stars of the cruise were the Atlantic bottlenose dolphins that surfaced several times near the boat. At one point, we anchored the boat on a shore, where we had a chance to explore the salt marshes along an island and learn about several creatures who had made our coast their home. We found tons of little fiddler crabs, a few larger blue crabs and some hermit crabs. 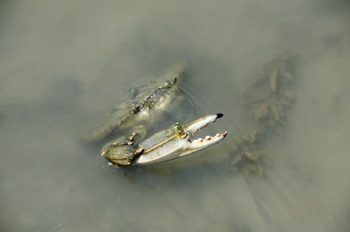 A blue crab pokes out of the water. Thanks to the cruise and several other educational opportunities the federation has provided, I’m learning new things about our coast every day. Through restoration efforts I’ve learned about living shorelines, explored towns in the area I might not have otherwise and learn about the diverse utility of oysters. Through workshops and meetings I’ve met important members from the community and heard about the work they do that often goes unnoticed by people in the community. Although I’ve spent 75 percent of my life in walking distance from the ocean or sound, this internship has introduced me to a side of our state’s coast that I had previously underappreciated.